I recently had a oh-so-fun day out with my cousins and my DH. I talked them into taking a little road trip for tea. 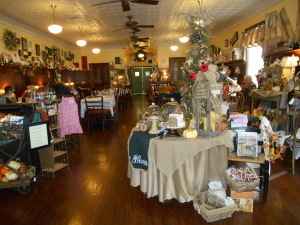 We went to to Burdett’s Tea Shop & Trading Company in Springfield, TN just north of Nashville. This is such a lively group – it’s sometimes hard to keep up with their fast-paced conversations! Springfield (not the home of Homer & Marge. That’s another Springfield.) is a tiny town that has the traditional small-town county courthouse square surrounded by 50% attorney’s offices and 50% shops. It’s so quaint and quiet – far away from the interstate and WalMart – which is really what you need every now and then. The tea shop’s got atmosphere. It’s in an older building with a tin ceiling and wood floors. 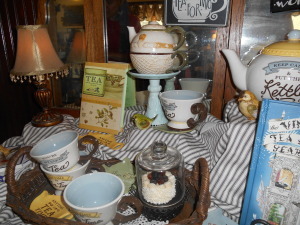 There’s gift items for sale and I thought the teapot display was cool. 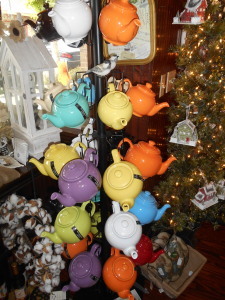 They looked like good, everyday teapots and, as you can see, had many colors to choose from. 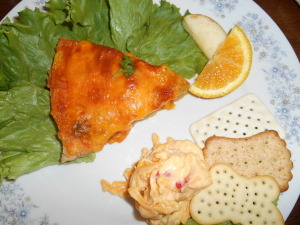 For lunch, I had the quiche and pimento cheese with crackers. 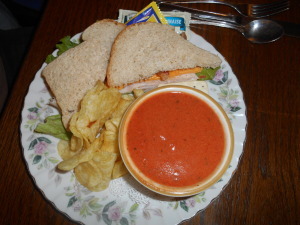 The others had sandwiches, soup and salad. 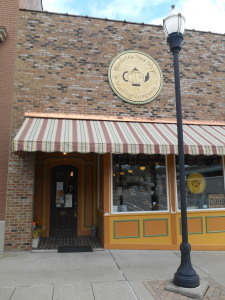 The bread was made by Schlabachs – a Mennonite bakery in the area. 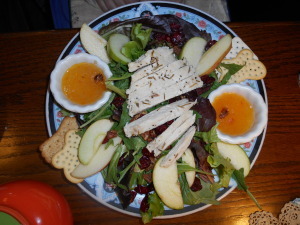 From the selection, I’d really call it a place to get a good lunch that also serves tea rather than a tea room but it was good food. 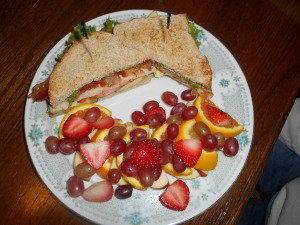 The Ultimate BLT and lots of fruit! I had their raspberry tea but it had such a strong artificial taste I switched it out to a safer choice and got just the house blend which was a straight black tea. 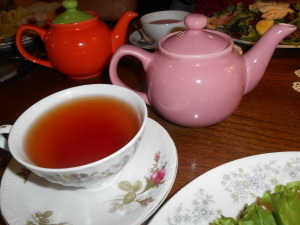 Be aware, they do not have bottomless teapots so you’ll only get a couple of cups out of the little pots. Their scones were truly exceptional. 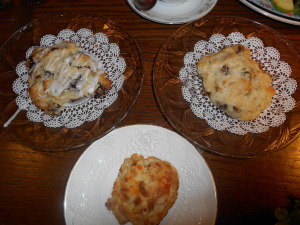 The gooey chocolate cherry scone was my favorite. It’s not on the menu but was part of the daily special. The ham & cheese scone was an interesting switch up of savory instead of sweet.